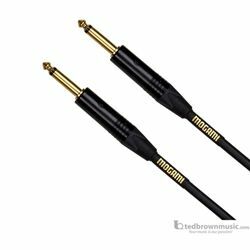 Ted Brown Music - Mogami Gold Instrument Cable 10ft. Fretted Instruments / Guitar & Fretted Accessories / Cables / Mogami Gold Instrument Cable 10ft. Mogami Gold Instrument Cable 10ft. Whether you're recording or performing live, you need cables that let you capture the full impact of your source. That's what you get with Mogami Gold. For decades, top audio engineers worldwide have chosen Mogami cabling for its superior audio clarity, low-loss signal transfer, vanishingly low noise, and consistent manufacturing quality. Mogami Gold uses the same microphone, instrument and multichannel interface cable found in world-class studios, backed with Mogami's no-excuses lifetime warranty. Cables are a vital component of your signal chain. Don't leave it to chance. Wire up with Mogami Gold. Professional engineers and musicians around the world have turned to Mogami for high-quality audio cables solution that are built to last. In fact, Mogami has invested years of research into developing some of the most transparent, "lossless" cables you can find. That's why the Sweetwater crew enthusiastically recommends them! So whether you're onstage or in the studio with a microphone, guitar, bass, or keyboard, you can trust Mogami cables to give you the full sound of your instrument, with ultra-low noise and maximum durability.